There are plenty of quick-cooking and instant grits on the market, but the deeper flavor and more developed texture of real grits are worth the bit of extra time it takes to make them. If you can, seek out stone-ground grits for the best flavor and texture. The whole dried corn kernels are ground by real stones, which creates grits that are not overly ground with minimal "dust" and slight variance in shape and size, creating more surface area and superior texture. Consider using broth instead of water to cook the grits. While this is in no way traditional, and traditionalists would scoff heartily at the very notion of such a thing, the fact remains that grits cooked in broth are crazy delicious. Pour the water or broth into a medium saucepan and bring to a boil over high heat. When the liquid boils, add the salt. Reduce the heat to maintain a strong, steady simmer. Pour the grits in a thin stream into the boiling water, whisking constantly as you do so (pour with your non-dominant hand and whisk with your dominant hand). Once all the grits are incorporated, reduce the heat to low. Let the grits simmer gently until they are thick and very tender, about 1 hour. Stir them frequently—every 5 minutes or so—to keep them from clumping up or sticking to the bottom of the pan. Add 1/4 cup water at a time, if needed to keep them from sticking. 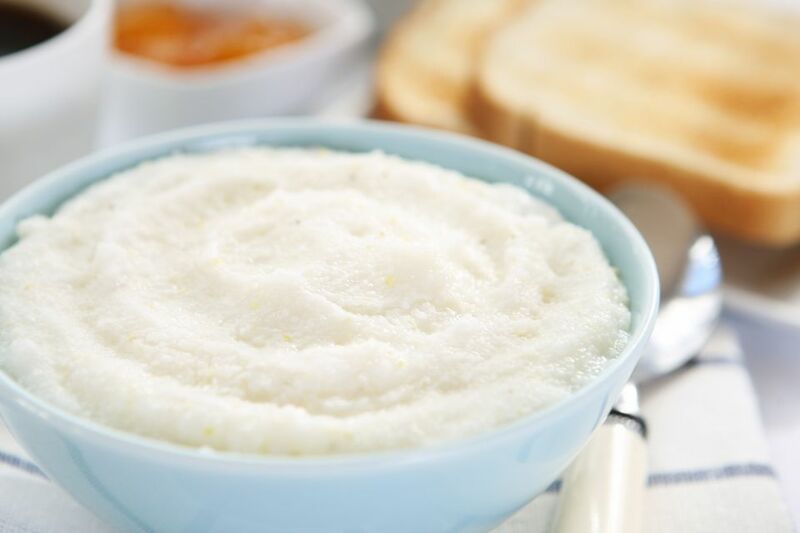 The tender cooked grits will be fairly creamy in texture if you stirred them to keep them from clumping and cooked them long enough. For truly creamy grits, you can stir in the butter and heavy cream before serving. Some people like to add plenty of freshly ground black pepper to grits. A drizzle of chili oil adds a luscious kick. Stir in 1/2 cup grated cheese (your choice) at the end. Give grits some serious oomph with a very small clove of garlic, minced and stirred in about half-way through cooking. Be judicious—a little really goes a long way! Include an herb garnish—like minced chives or finely chopped scallions—for additional color and flavor.